To meet Hong Kong’s rising housing need, the Hong Kong planning bureau has assigned an area south of the New Town of Yuen Long to new affordable housing development. The proposed planning & urban design option suggests to leave a green corridor connecting the agricultural land of the existing village with the mountain in the south of the site. The corridor is flanked by medium-rise housing grouped around 14 green semi-public gardens, which extend the green corridor into the housing area. In this proposal, the potential of the PDAs for the provision of public and private housing is maximised. It focuses on the provision of high density public and private housing in the PDAs, together with a new district centre serving the new community. The highest density developed is envisaged in areas A and B, close to strategic transport infrastructure and links to mass transit. Medium-low density housing development is envisaged in areas C and D, closer to the more sensitive fringes of the Tai Tam Country Park. There would be an emphasis on urban regeneration through a combination of redevelopment and rehabilitation in Tong Yan San Tsuen. 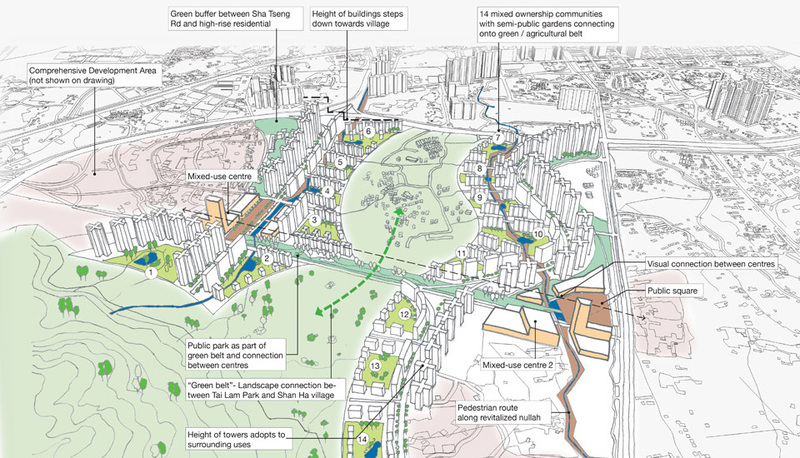 The option envisages a radical approach to village development west of the nullah, including the potential re-location of some village housing. Thus following development of the PDAs the strong visual and cultural identity of the village communities of Tin Liu Tsuen, Mak Kiu Tau Tsuen and Wong Nai Tun Tsuen will be retained. The concept option can be flexible to accommodate a range of employment generating uses, responding to demand factors and opportunities. It can also be flexible enough to accommodate areas for the local re-location of open storage and other informal uses.